Sometimes, your fiercest rivals are those that live the closest to you, especially those within your own county. Growing up as a Hiltopper, I knew how important it was to beat the Litchfield Panthers, and with Kyle as a Lancer, he had some of the same feelings about the Nokomis Redskins. On the field, these teams may be rivals, but off the field, they're definitely teammates. So, the county high school baseball tournament is always exciting. Every single player for all four county teams wants to be the ones that come out on top, and best their county rivals. But for a few brief moments on Saturday, April 16, every player, from all four schools was on the field, and they were smiling. And we couldn't be prouder. 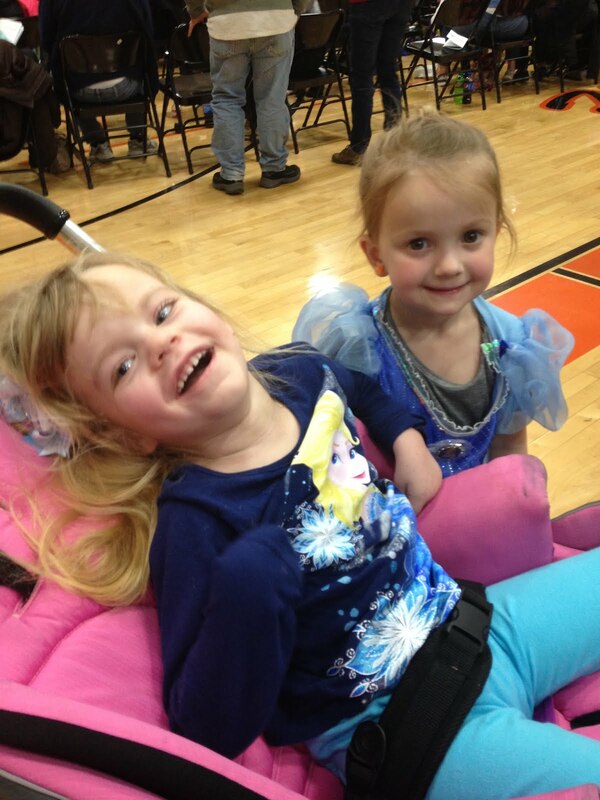 You see, this year's county baseball tournament was the culmination of a Litchfield High School Student Council fundraiser for Grace. Last winter, the Student Council sponsor Jo Brummet and her students set up a temporary license plate program with the state of Illinois. Participants could pay $30, and the plates would be valid for two months in the spring. We opted to use the Princess Grace logo from the 5K event last fall, and each license plate could have four characters on it. Kyle and I were quick to decide that we wanted BEAT INAD on our two vehicles, but it was fun to see what everyone else chose. My mom and dad chose HOPE and PRAY, while Kyle's mom and dad chose EP28 (for a favorite scripture verse) and PAPA. Other family members chose LOVE, LOV3, BSBL and GLH 7. All total, I think they sold about 50 of the specialty plates. We LOVED our BEAT INAD plates! I think the best part for me was driving around the county and seeing the plates, trying to figure out whose they were and what they stood for. And even though he lives out of state, Kyle and I ordered a set for the INAD researcher, Dr. Paul Kotzbauer, who already has his hanging in his office at Washington University. 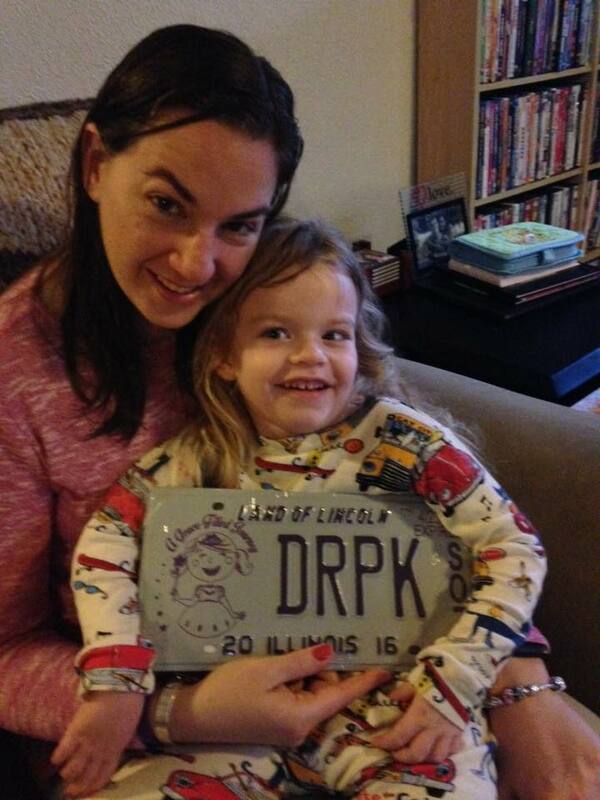 Grace couldn't wait to give Dr. Kotzbauer his plates. As part of the fundraiser, the Student Council planned a culminating event at the county tournament and also sold T-shirts. I can't tell you how much I love all my Grace shirts, which now number more than a dozen. I practically live in them (so it's definitely a good thing I have so many!) And every time I see others wearing Grace shirts, I know they have a chance to raise even more awareness for INAD. We really liked these shirts too, as they had the team logos for all four county teams on them, and all the school districts have done so much for us. We are especially looking up to the second annual "Step Up to the Plate for Grace" when Lincolnwood and Morrisonville baseball teams play each other this week. Kyle's almost always a fixture at the county tournament, as he covers it for work, but Grace and I were excited to go with him this year, and share the experience with our families as well. Kyle's sister and her husband brought our nephew, and some of his cousins came too, and we always enjoy a chance to catch up. Jo Brummet presented us $2,000 for INAD research. Shortly after we arrived, Jo Brummet and her son set up photos for us with each of the teams wearing their new Grace shirts. Then, when the first game was finished, we were invited onto the field with all the teams for a HUGE group photo and check presentation. We were blown away when Jo announced that they raised $2,000 for INAD research. Just chilling with her grandparents. Grace with the members of Kyle's family who came to the game. It also gave us a chance to say thanks to the teams and coaches for their love and support, as we continue in the fight against INAD. Each team also signed a baseball for Grace and the Lincolnwood coach, Josh Stone, got a really cool display case for all four of them. Our next living room renovation includes some shelving to put all her autographed balls on display, which will be such a testament to the love and support of this community. Kyle and Grace show off her new display case and autographed baseballs. We stayed for a bit of the second game before heading out to lunch with some of Kyle's family, and felt so blessed to be a part of a tournament with such history in Montgomery County. From Lancers and Redskins to Toppers and Panthers (and Mohawks too), it's truly been a special part of this Grace-Filled Journey. They may be rivals on the field, but off the field, they are ALL teammates in the fight to #beatINAD. Meet the wolf. Alexander T. Wolf to be exact. And he has a story to tell. As I combed through Grace's books this month, trying to decide on a column idea, I came across one of our favorites, "The TRUE Story of the Three Little Pigs" by Jon Scieskza. It was a gift from Kyle's aunt, Kathy, to Grace on her birthday one year. Everyone knows the story of The Three Little Pigs. Each one builds a house, one of straw, one of sticks and one of bricks. The wolf comes to visit each one, and by "huffing and puffing" manages to blow down the first two houses rather easily. However, he can't manage to blow down the brick house, and the moral of the story is that you should build your life on a firm foundation with solid materials. And that's exactly how this book starts out, "Everyone knows the story of The Three Little Pigs. Or at least they think they do. But I'll let you in on a little secret. Nobody knows the real story, because nobody has ever heard my side of the story." Alexander T. Wolf goes on to introduce himself to readers, and questions how the whole "Big Bad Wolf" rumors got started. "Maybe it's because of our diet. Hey it's not my fault wolves eat cute little animals like bunnies and sheep and pigs. That's just the way we are. If cheeseburgers were cute, folks would probably think you were Big and Bad too." Al goes on to say that the real story is about a sneeze and a cup of sugar. You see, he's making a cake for his "dear sweet old granny's birthday," when he runs out of sugar. So, he goes to his neighbor's house to borrow a cup. "Now this neighbor was a pig. And he wasn't too bright either. He had built his whole house of straw." Upon arriving, Al finds that no one will answer the door. Just as he is about to leave, he feels a sneeze coming on, and the whole straw house falls down. And in the middle of the mess, he finds the first little pig, dead as a doornail. "It seemed like a shame to leave a perfectly good ham dinner just lying there in the straw. So I ate it up. Think of it as a big cheeseburger just lying there." And wouldn't you know it, but the exact same thing happens at the second neighbor's house, so Al eats him up too. When he arrives at the third little pig's house, it's made of bricks, and this pig won't loan him a cup of sugar. After besmirching the name of his "dear sweet old granny," Al goes a little crazy. He starts huffing and snuffing and sneezing and making a real scene. By the end of the story, poor Al has landed himself in jail, still without his cup of sugar, and has been officially labelled as the "Big Bad Wolf." "That's it, the real story. I was framed." Whether or not you choose to believe Al's version of the story, it's a great reminder that there are always two sides to every story. We shouldn't be so hasty and rush to judgement about someone or something, based solely on what we hear or read on Facebook. Maybe Al made the whole thing up. Maybe he's rightly serving his time in jail, still awaiting that cup of sugar. But it's still not our place to judge Al, no matter what we really think of him. We live in the age of instant news, and not always reputable news sources. Some media outlets jump to conclusions just to be the first to share a story. And while stories can be corrected, most times the damage to someone's reputation can't be undone. As I go about my daily life, I sometimes find myself quick to judge someone else about their choices. When I stop to remember the love and compassion that Jesus showed to everyone, it's a little easier to take a step back and remember that I don't always know the whole story. Instead of being quick to judge someone, I'm going to practice stopping to say a prayer for them and their particular situation. I know that's what I would want someone to do for me. 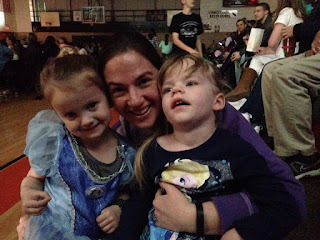 Looking to take Grace on another enchanted evening, we made our way to this year's Hillsboro High School production of Cinderella on Friday evening, and it definitely left us feeling both inspired and enchanted. We took Grace to see Cinderella this weekend! It was a relatively light work weekend, so Kyle and I were trying to decide what to do with an open Friday evening. We had talked about taking Grace to see Cinderella, but we couldn't decide. For me, I worried it would be kind of hard. 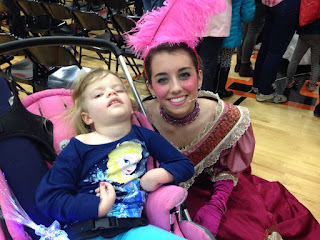 I participated in the operetta all four years while I was at Hillsboro High School, and as I looked back on my wonderful memories, I worried it would get me thinking about the fact that Grace wouldn't have that same experience someday. In the end, we decided it would be more fun to go together as a family, than to just stay at home, and it turned out to be such a great decision. Hanging out with Hazel before the show! In true Herschelman family fashion, we arrived only moments before the show started. Kyle dropped Grace and I at the door, while he parked the van, and we quickly found some seats in the bleachers before the show started. One of Grace's preschool friends, Hazel, came over to see her before the start of the show. It's a little blurry, but Grace loved watching the carriage ride by. The lights went down, and the magic truly did begin. From the elaborate sets and costumes to the talented students, we enjoyed every single minute. Grace smiled anytime the music started, and loved the part when Cinderella and the Fairy Godmother rode right in front of us in the carriage. Grace loved seeing Hazel again at intermission! 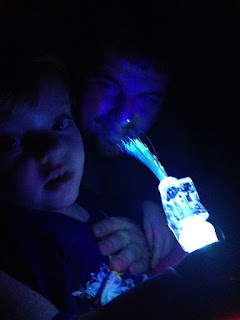 Our favorite part came just before that, when Cinderella and the Fairy Godmother sang a song called, "Impossible." As Cinderella sings about not being able to go to the ball, the Fairy Godmother sings about how "impossible things are happening every day." I looked over at Kyle, who had a tear or two in his eye, thinking about what impossible things we hope and dream will happen. It's true, impossible things ARE happening every day, and we will NEVER give up the fight to #beatINAD. At intermission, Kyle went to get her stroller so she would have a chance to sit by herself for the second act. She and I sat in our seats and enjoyed visiting with many other theater-goers who stopped by to see us. Our friend, Earlene, stopped by and gave Grace a star light-up wand, which was one of her very favorite things. 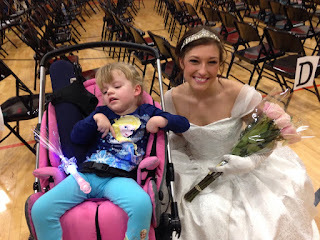 Hazel also stopped by again to show Grace her light-up Cinderella dress, and a few other preschool friends came by too. These two goofballs during act two! Grace got a little restless in act two, as do many four-year-old kids, but daddy kept her entertained with the light-up wand. 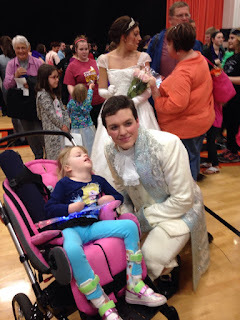 As the final curtain call finished, we stuck around so give Grace a chance to meet some of the high school actors and actresses, which by far was Grace's favorite part of the whole night. We made our way to the gym floor, and stopped first to see Alli, who had been one of the evil stepsisters. Alli works at the paper, so she already knew Grace, and stopped to talk to her, and Grace certainly ate up all the attention. Talking to Alli Reeves, who played the evil stepsiter, Joy. Grace and Alli as Joy. Grace with Chris Storm as Lionel. Taking a photo with Lionel. We made our way to Cinderella, Lionel, Prince Christopher, Joy and even the Fairy Godmother before heading out. 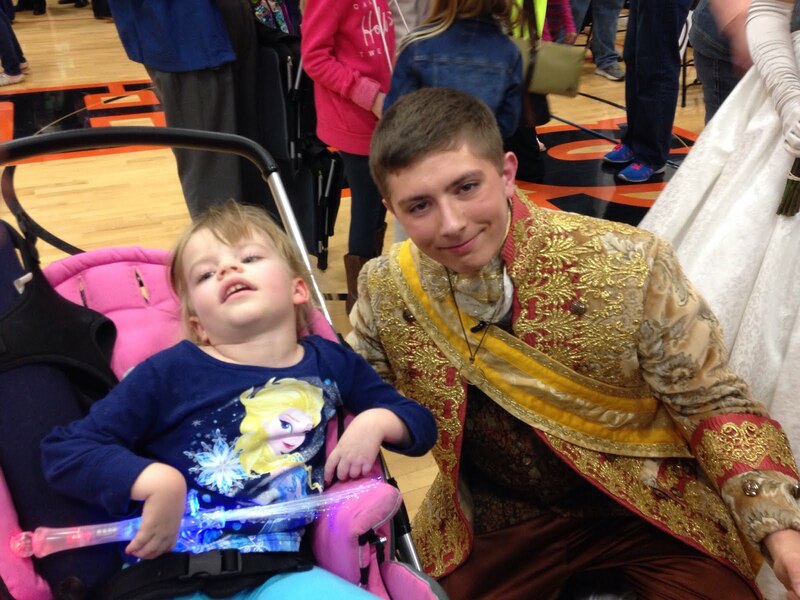 Even though most of the little girls favorite character was Cinderella, Grace's seemed to be the handsome prince. He stopped to pose for a photo and talk to Grace, and she just kept grinning up at him. It was so sweet, even if it did make Grace's daddy a little nervous. 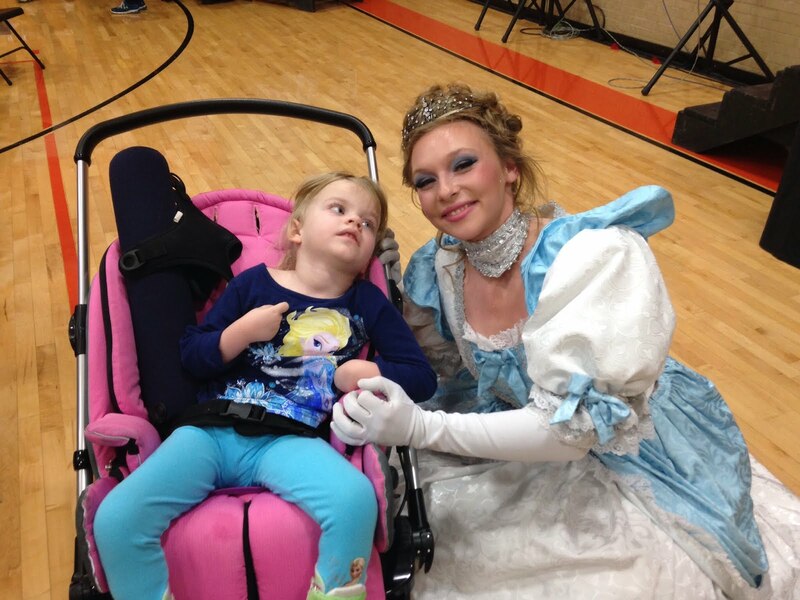 Grace and Fallon Sellers as Cinderella. Grace with Shruthi Mekala as the evil stepsister, Grace. 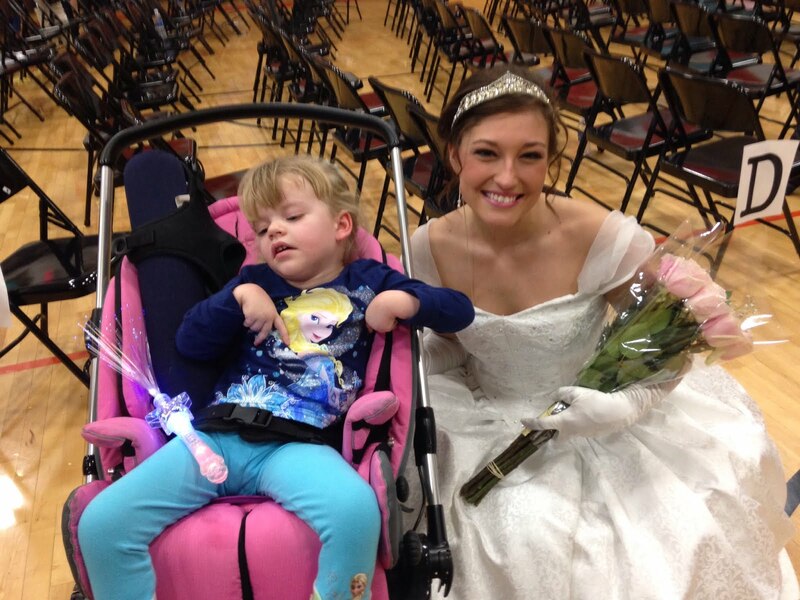 Grace and Maddie Mizera as the Fairy Godmother. Grace was especially excited about her tiara. Grace had SO many smiles for Prince Christopher. 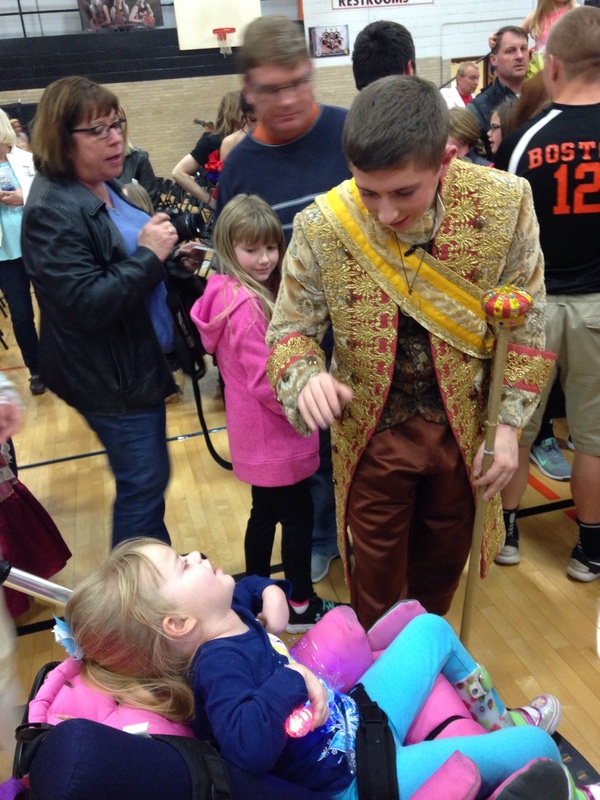 Our special thanks to everyone who helped to make this year's Hillsboro High School operetta such an enchanted opportunity for our sweet Grace and for our community. 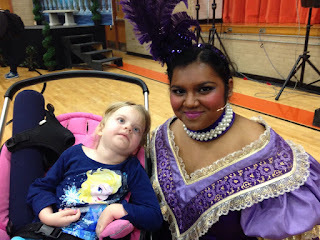 Grace may not be able to make the same memories I did as a member of the cast, but she definitely enjoyed being part of this year's audience. Remember to always keep dreaming because "impossible things are happening every day!" Easter has long been one of my favorite holidays. It's a time to celebrate renewal and new life, and the resurrection of Jesus on the cross. And it's a time to spend with family and friends, sharing love and laughter. Our Easter celebration started in the middle of the week with an egg hunt at preschool with Grace's friends and classmates. All of the eggs were hidden outside around the playground, and after finding a personalized egg, Kyle and I helped Grace to find some eggs for the bag she decorated. It was fun to watch the kids open their eggs and see the joy across their faces when they discovered the treasures inside. It's been a really great year in preschool this year, and the kids just love on Grace. 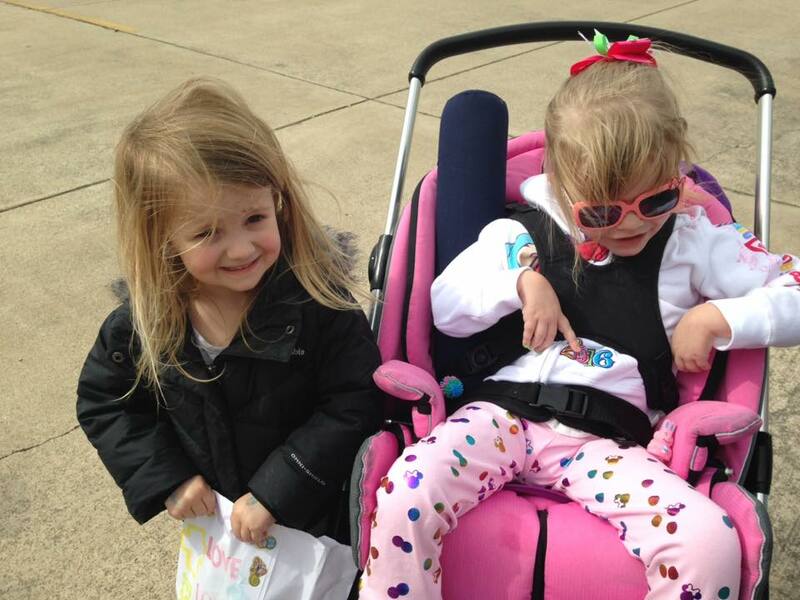 Grace and her friend, Hazel, at the preschool egg hunt. Grace loved finding the eggs! 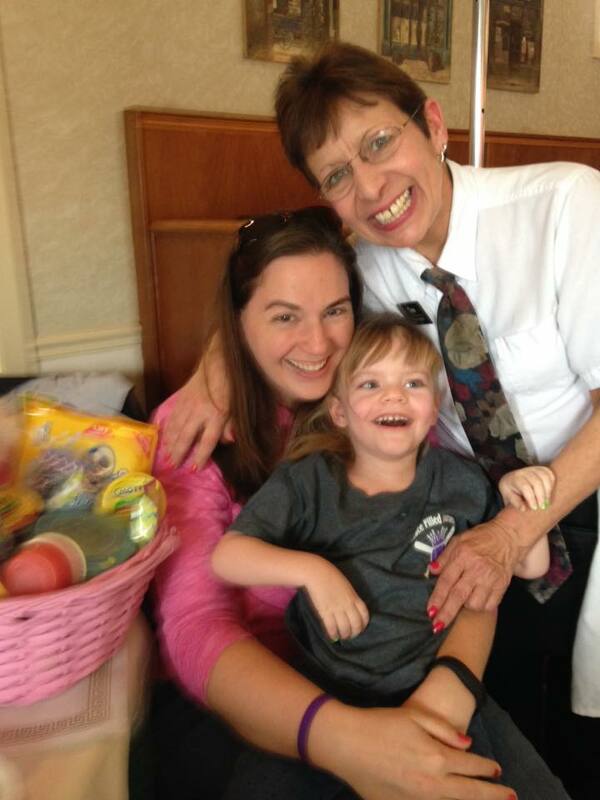 The following day, Grace was in for a very special treat, when our friend, Tina, gave Grace a very special Easter basket during our regular weekly lunch at The Ariston Cafe. Grace was so excited about her basket from Tina. We were good little egg hunters this year, and our next egg hunt was on Saturday. There are always lots of egg hunts throughout the county, so we are busy covering them throughout the day. 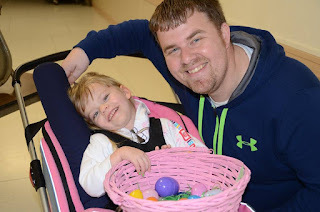 I picked to cover the one in Taylor Springs because they offer a special needs egg hunt inside the community center, and we thought it would be a good spot to help Grace hunt some eggs. Grace and her dad LOVED hunting eggs in Taylor Springs! I set up to take some photos outside the zero to two age bracket, and Kyle helped Grace hunt eggs inside. He said she would just giggle and giggle when he put them in her basket. And I got a huge smile when I came in from taking photos outside. I had hoped to see Kyle and Grace hunting eggs, but they were pretty fast. After a nap on Saturday afternoon, we walked across the back yard to Grandma and Grandpa Galer's house. PaPa John had carefully hid eggs among the plants in their landscaping, and even a couple in the mailbox. Grace held tight to the basket in her lap, and PaPa John and I took turns tossing the eggs we found in her basket, much to Grace's delight. The eggs each had a $1 bill inside for Grace's savings account. Grace kept a tight hold on her basket. Hunting eggs with PaPa John is so much fun! When we had hunted all the eggs, we headed inside for a special dinner, PaPa John's egg casserole. As mom and dad put the finishing touches on our breakfast for dinner, Kyle and I helped Grace open her Easter basket from them, including some candy, a few new books and a copy of Bedknobs and Broomsticks on DVD to watch in the van on the way to therapy. It was one of my favorites growing up, and I knew Grace would love all the music. Checking out all the goodies in her Easter basket. Dinner was wonderful, and I think we ate until we couldn't move. Kyle headed back home to do some writing for work, and Grace and I promised to help mom fill eggs for the church's Easter egg hunt the next morning. PaPa John entertained Grace while mom and I filled all the eggs. Playing with PaPa John is lots of fun! Then it was time to head for home and get to bed early so the Easter Bunny could stop at our house! We tucked Grace in to bed and gave her a kiss. And when she awoke the next morning, there was her Easter basket, right next to her bed. It had bubbles, M&Ms, a couple of pairs of jeans and a copy of the new Peanuts movie. She was surprised the Easter Bunny stopped in her room! We ate a quick breakfast at home before getting ready to head to church. Grace looked so pretty in her new pink dress. Kyle was the worship leader at church, and when we got there, the song leader was gone, so Kyle asked if I would help out. Grace sat with mom and dad, and Kyle and I sat up front together. It was a very moving church service, and just a wonderful time to be together as a family. 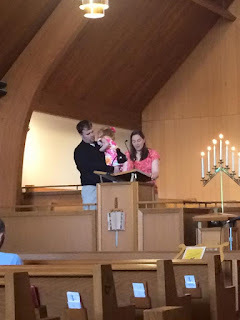 When the service concluded, the kids headed outside for another egg hunt. Grace had a little pink basket, and one of the other girls, Jaida, helped her to hunt some eggs. She especially liked the little rubber ducks in some of the eggs. 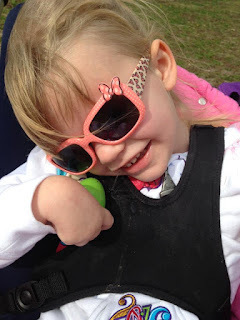 And we loved her sweet smile when she snuggled with a new stuffed pink bunny after the hunt. Jaida helped Grace on the egg hunt. We stopped briefly by the house to pick up a few things en route to one of our favorite places, The Ariston Cafe in Litchfield for Easter brunch with the Galer clan. The food was fantastic, even though we all probably ate too much of it. And the company was even better. It was fun to catch up with everyone, and just enjoy being together. Our sweet princess and her new pink bunny. Hanging out with Grandma Susie at the Ariston. Since it was a Sunday, Kyle and I had to go into work at the paper, so we took Grace to Kyle's mom and dad's house, and she found a few more Easter surprises with a new sparkly Cinderella purse and some more books. And of course, she found some snuggles with Grandma Kim. Reading Easter stories with Grandma Kim. As we paused to celebrate Jesus and the life he gave for us, we stopped to count all of our blessings. Although we still pray for a miracle every single day, we also know this journey is part of a greater plan for our lives. There are good days and bad days, but with a little faith and a little hope, we can make the most of all the time we are blessed to have Grace in our lives.